Join young,orphaned Oliver Twist as he navigates the London’s underworld of theft and violence, searching for a home, a family, and – most importantly – for love. The show is a brilliant Dicken’s story and an actor’s delight with characters such as the conniving, charismatic Fagin, the love-struck Nancy, comedic Mr. Bumble and the Widow Corney, the ultimate villain Bill Sykes, and the sweetly vulnerable Oliver. With spirited, timeless songs like “As Long as He Needs Me,” “Food, Glorious Food,” and “Where is Love,” Oliver! is a musical classic. 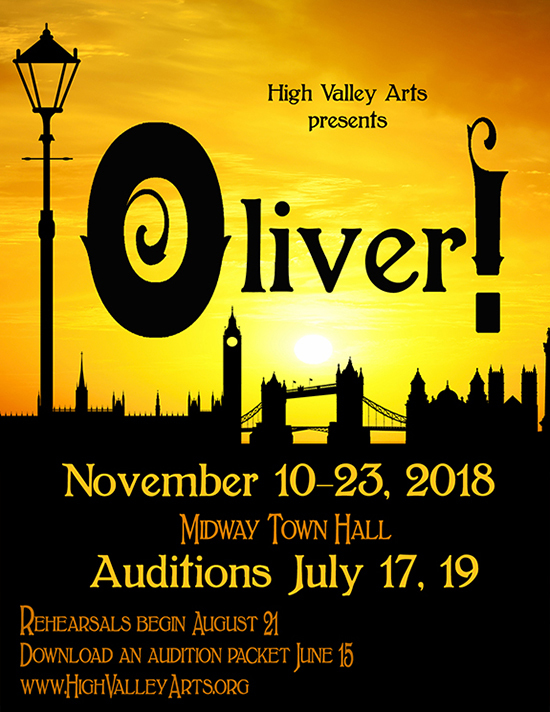 Auditions July 17 & 19m, 7-9 pm; July 21 1-3 p.m. Download audition packet at www.HighValleyArts.org with information about rehearsals, performances, and cast of characters. Prepare a 16-measure song in the style of the show. Rehearsals begin August 21. Show performs Nov. 10-24. No shows on Thanksgiving, Sundays, or Tuesdays. Travel stipend paid to actors traveling from Salt Lake City or the Provo/Orem area.